Matt Murray is a very good goalie. Matt Murray is the future of this franchise. Matt Murray is an elite level goaltender. But the net belongs to Marc-Andre Fleury. 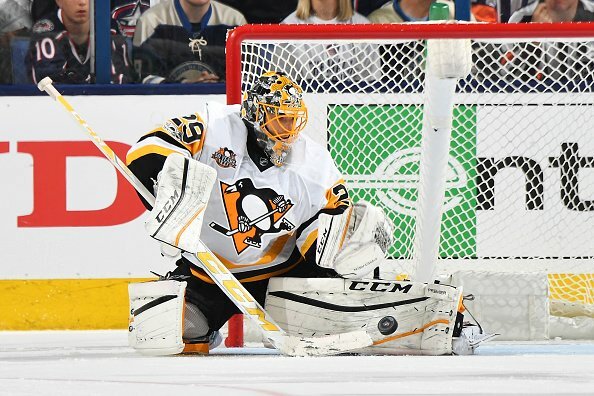 When Matt Murray came up lame during warmups of Game 1 of the Eastern Conference Quarterfinals the Penguins turned to a familiar face: their backup goalie, Marc-Andre Fleury. A two time Stanley Cup champion, an Olympic gold medalist, and franchise all time leader in wins Marc was no slouch. Any other team he'd be the starter, but Matt Murray's rocket like transcendence (on the heels of a Marc-Andre Fleury injury, no less) had pushed him back to backup. To answer, Fleury merely posted a 1.00 GAA and a .970 save percentage in helping to back the Penguins to a 2-0 series lead, holding the fort through two lackluster first periods in each of Game 1 and Game 2. Last night, with another horrid start to the game, Fleury showed to be a little more human as the wall he formed while the team around him faltered showed some cracks. A 3-1 lead to the end the first had people calling for Fleury's head and for Tristan Jarry (!!!) to start, even though common sense showed that you'd be hard pressed to put much blame squarely on Fleury for any one of those goals. While his overall .892 save percentage doesn't look swell, it ignores that from the second period on he posted a sterling .956 save percentage (22/23 stopped) and shut down the Blue Jackets when they'd finally counter from the Penguins continued surge. Outside of one period, in which the entire team played poorly and Fleury was merely a piece of the puzzle and not the reason for failure (as has absolutely been the case in the past), Fleury has allowed three goals. He's registered a .968 save percentage excluding the entire teams failure of a first period. He has a 1.00 GAA in that same time frame. Even accounting for the awful spell when everyone collapsed under the best effort the Blue Jackets had, their absolute best punch (which was answered from everyone single position with aplomb) Fleury's stats are impressive: 1.87 GAA, .945 save percentage. With a 3-0 series lead, the Blue Jackets best punches answered blow for blow, and a team riding high on the second best record in the regular season, full confidence in its starter, and some nostalgia powering an engine that right now looks hard to beat, there's absolutely zero reason to bring back Matt Murray even when healthy. Like last year's run, until there are continued cracks in the foundation there's no reason to swap. Until then the net belongs to Marc-Andre Fleury as he writes his own ending to his Penguins career.